Video games are emergent systems with their own particular internal relationships. This animation mashes up and deconstructs game spaces taking on a multitude of forms, from scrolling on one axis to several separate screens. The blocky 2D grids plasticity is emphasized through a reduced color palette in order to favor formal representation of early video games against the photorealistic, logically consistent 3D game spaces of recent years. s-ara is a visual artist that spent endless hours shooting at monsters and strolling through mazes. So, it only felt natural for her to evolve through an experimental and explorative process of the visual culture of video games and popular gif files in her animations. She still plays old school computer games. Video games are a pervasive media that are influencing a wide range of social and cultural practices, so it only felt natural for Sandra Araújo to evoke them for inspirational source. The endless hours shooting at monsters and strolling through mazes heavily influenced her discourse and aesthetic when she first pursued photography as the medium of choice to complete her academic studies. Nevertheless, in a single-shot image the visual and audio immersiveness of video games got lost in the threads of the creative process. In order to achieve some of the interaction and game play qualities of video game she became involved into 2D computer animation. 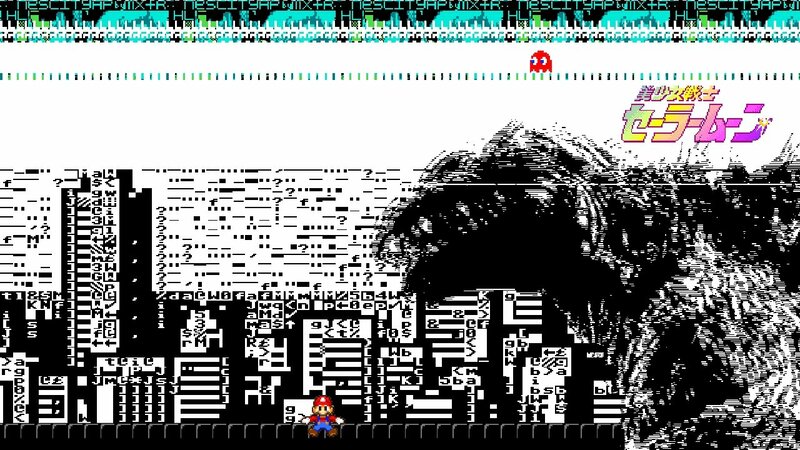 That gave her the opportunity of mashing-up iconic video game characters and scenarios with 8bit music. The gif format is also used for its animation abilities and widespread browser integration. It also resembles game patterns and gives it a playfulness feel and nonsense aura by splattering different mediums into a single-channel video screening. When trying to sum up that work / play affair she says, ʻThe main purpose is to create animations that evolve through an experimental and explorative process of the visual culture of video games and the spread of popular gif files. That aesthetic choice reflects and reiterates lo-fi quality and bug / glitch images of early computer games.ʼ She still plays old school video games. Sandra Araújo is a visual artist undergoing the MA in Artistic Studies – Theory and Critic of Art program at Faculty of Fine Arts of University of Porto. Her experimental animations have been screened mostly in independent film and new media festivals across Europe, Canada and the United States.